From panini to martinis, these condiments impart elegant flavors that elevate any dish (or drink!). There are some who argue that pancakes are but a mere vehicle for syrup, that greens are little more than a conduit for salad dressing. 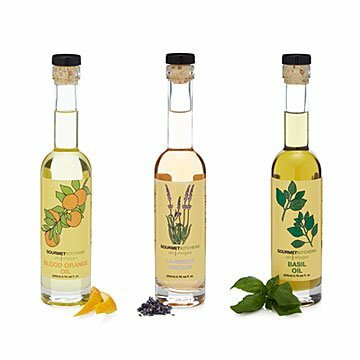 For those who revel in fragrant flavors that can be drizzled and absorbed, this set of infused oils and vinegar is bound to delight. Both oils have a grapeseed basean ideal oil for cooking because of its high smoke point. Use the Blood Orange Oil when a dish calls for a citrusy tang: to sauté vegetables, or atop snacks ranging from avocado slices to brownies. The white wine-based Lavender Vinegar is perhaps the most nuanced of all, adding unexpected notes to vinaigrettes, marinades, and even martini mixes. And the Basil Oil has a distinctly Italian flavor profile that adds a fine finish to panini, pizza, and mozzarella salads. Made in California.